Figure-1: Freeze-frame of the interesting SVT rhythm in this video. See YouTube link for additional monitoring. NOTE — Enlarge by clicking on Figures — Right-Click to open in a separate window. MORAL of this Video: — that artifact unfortunately often precludes accurate determination of atrial activity (therefore disguising the mechanism of tachycardias such as this one ...). That said — fun to look at (to the music of Vivaldi's 4 Seasons). ACKNOWLEDGMENT: My appreciation goes to Alex Kroeze for allowing me to edit and post his tracings. 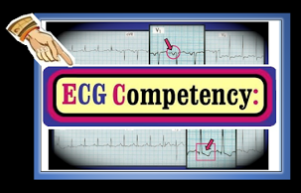 NOTE: This is the "short version" of my ECG Blog #107 — in that I only address the 3-lead rhythm strip shown below (which was Figure-3 in Blog #107). The simultaneously-recorded 3-lead rhythm strip shown in the Figure was obtained from a 69-year old woman with a longterm history of palpitations. Her symptoms had been increasing over recent weeks, in association with "chest tightness" and dizziness. Her prior medical history was benign — and she was hemodynamically stable at the time this tracing was recorded. How would you interpret the rhythm shown in the Figure? Figure: Simultaneously-recorded 3-lead Rhythm Strip, obtained from a 69-year old woman with palpitations. She was hemodynamically stable at the time of this tracing. What is the rhythm? 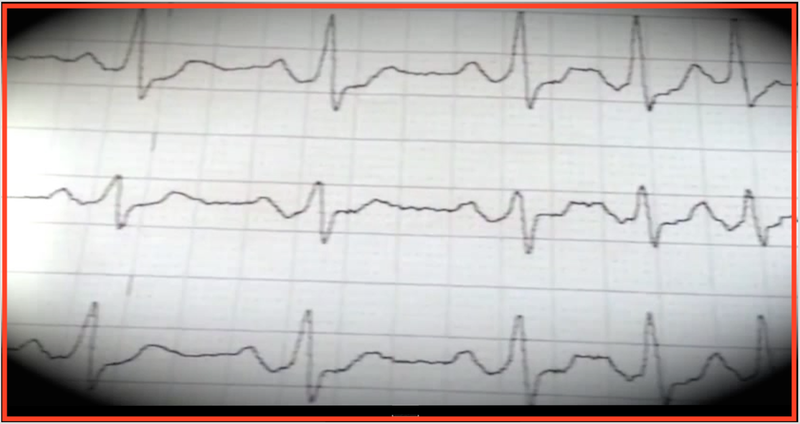 What clinical implications are associated with this rhythm? NOTE — Enlarge by clicking on Figures — Right-Click to open in a separate window. Interpretation: The rhythm is fairly regular — albeit with slight variation in rate. The QRS complex is wide (at least 3 little boxes = ≥0.12 second in duration). Normal sinus P waves are missing in lead II. Instead, there are retrograde (negative) P waves that are clearly seen to occur after the QRS in lead II (red arrows). The rhythm is AIVR (Accelerated IdioVentricular Rhythm) — which is a slower form of ventricular tachycardia. Discussion: AIVR is an "enhanced" ventricular ectopic rhythm that occurs faster than the intrinsic ventricular escape rate (which is ~20-40/minute) — and slower than hemodynamically significant Ventricular Tachycardia (ie, VT at rates >130-140/minute). The usual rate of AIVR is therefore between ~60-110/minute (with an area of "overlap" between AIVR and fast VT at ~110-130/minute). AIVR generally occurs in one of the following clinical settings: i) as a rhythm during cardiac arrest; ii) in the monitoring phase of acute MI (especially with inferior MI); or iii) as a reperfusion arrhythmia (following thrombolysis, acute angioplasty, or spontaneous reperfusion). It may also occur in patients with underlying coronary disease, cardiomyopathy, and with digoxin toxicity. Note: On rare occasions — AIVR may occur intermittently in otherwise healthy subjects without underlying heart disease. If such subjects are asymptomatic during episodes — then no treatment is needed. KEY: The importance of distinguishing between AIVR (ie, "slow VT" ) — vs "fast VT" (heart rate generally ≥130/minute) — is that active treatment of AIVR is usually not needed (provided the patient is hemodynamically stable and tolerating the rhythm) — whereas the opposite is true for sustained VT. Instead — "benign neglect" ( = observation) is often the most prudent course of action (in addition to ensuring adequate oxygenation, normal electrolytes, etc.) for AIVR — since this form of ventricular rhythm is far less likely to deteriorate to fast VT/VFib. 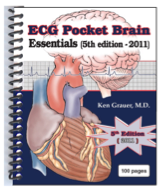 As we have already noted — there is an intermediate ( = "gray zone" ) rate range when the ventricular rhythm is in between ~110-130/minute, for which clinical judgment is needed (depending on the scenario) for determining whether active treatment of the ventricular rhythm is likely to be needed. ACKNOWLEDGMENT: My appreciation goes to Sam Walker (from Auckland, New Zealand) for allowing me to use this case and these tracings. 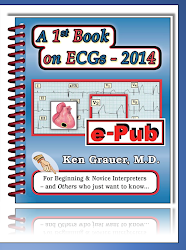 For a review pdf of basic Rhythm Interpretation ( = Section 02.0 from my ECG-2014-ePub) — GO TO http://tinyurl.com/ECG-2-Rhythm — AIVR is reviewed in Section 02.38. 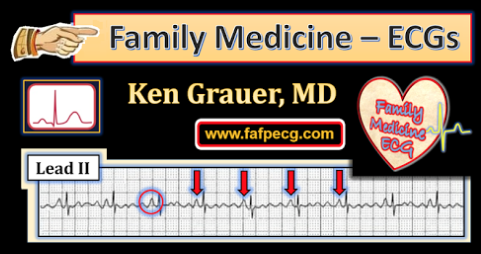 For full review of additional more complex tracings obtained on this patient — Please see our ECG Blog #107. Riera ARP, et al: AIVR: Chronology and Main Discoveries: Indian Pacing and EP Journal 10: 40-48, 2010. The tracings shown in Figure-1, Figure-2, and Figure-3 — were obtained in short succession from a 69-year old woman with a history of intermittent, brief duration palpitations over the past few years. Palpitations had been increasing over the past 2 weeks. On the day of admission, she developed chest tightness with "dizziness". On hearing this story and noting the irregularity in her rhythm — her primary care physician referred the patient for admission to the hospital. Past Medical History — fairly benign. No significant cardiac history. NO medications! NOTE: At no time during transport to the hospital was the patient unstable. That said, her BP decreased from 130/75 mmHg to 105 mmHg systolic at the time the rhythm strip in Figure-3 was recorded. How would you interpret this series of tracings? 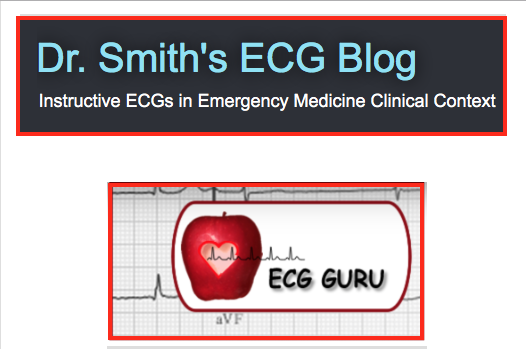 Is there evidence of atrial activity? If so — Is there any normal atrial activity? Can you explain the reason for the change in rhythm seen in Figure-1 compared to the rhythm seen in Figure-3? Can you explain why her BP decreased at the time the rhythm in Figure-3 was recorded? Does the patient's 12-lead ECG explain the longterm history of palpitations? Clinically — How would you proceed? Is immediate treatment indicated? Figure-1: Initial 3-lead Rhythm Strip, obtained from a 69-year old woman with a longterm history of palpitations. She was hemodynamically stable at the time of this tracing. What is the rhythm? NOTE — Enlarge by clicking on Figures — Right-Click to open in a separate window. Figure-2: 12-lead ECG obtained shortly after the rhythm strip in Figure-1 was recorded. 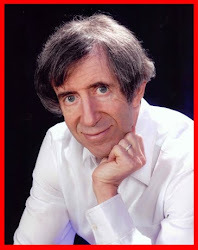 Is there evidence of normal atrial activity? Does this 12-lead ECG explain the reason for this patient's longterm palpitations? Figure-3: Subsequent 3-lead Rhythm Strip. Of note, the patient's BP decreased from 130/75 mmHg to 105 mmHg systolic at the time this tracing was recorded. What might explain this decrease in blood pressure? The "SHORT" Answer: We see no evidence of sinus rhythm — since an upright conducting P wave is never seen in lead II on any of these 3 tracings. Regardless of whether one postulates an ectopic low atrial rhythm (negative conducting P waves are intermittently seen in lead II) — vs a complex mechanism of retrograde atrial conduction from ventricular beats that intermittently capture the ventricles (via echo beats) — there is an absence of normal sinus P wave conduction. 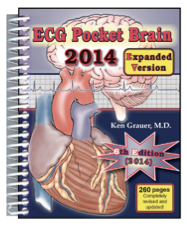 There are frequent ventricular beats occurring at a relatively slow rate. These occur in couplets in Figure-4 (beats #2,3; 5,6; 8,9; and 11,12). In Figure-3 — they occurred as a run of AIVR (Accelerated IdioVentricular Rhythm), as we'll discuss more in Figure-6. Figure-4: I have labeled Figure-1. RED arrows indicate negative P waves in lead II. 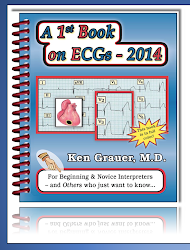 Beats #1,4,7,10 and 13 are narrow and are supraventricular. Pairs of ventricular beats are seen for beats #2,3; 5,6; 8,9; and 11,12 (See text). Completion of the "SHORT" Answer: AIVR is an "enhanced" ventricular ectopic rhythm that occurs faster than the intrinsic ventricular escape rate (which is ~20-40/minute) — and slower than hemodynamically significant Ventricular Tachycardia (ie, VT at rates >130-140/minute). The usual rate of AIVR is therefore between ~60-110/minute (with an area of "overlap" between AIVR and fast VT at ~120-130/minute). AIVR generally occurs in one of the following clinical settings: i) as a rhythm during cardiac arrest; ii) in the monitoring phase of acute MI (especially with inferior MI); or iii) as a reperfusion arrhythmia (following thrombolytics, angioplasty, or spontaneous reperfusion). It may also occur in patients with underlying coronary disease, cardiomyopathy, or digoxin toxicity. NOTE: — On rare occasions, intermittent AIVR may occur in otherwise healthy subjects without underlying heart disease. In such instances, no treatment may be needed if the patient is asymptomatic during episodes. TIME for the FASCINATING ANSWER: Despite seeming regularity of the negative P waves in lead II of Figure-4 (red arrows) — We do not think this represents an ectopic low atrial rhythm. This is because in Figure-3 there is 1:1 V:A ( = retrograde) conduction (See Figure-7 below) — and, morphology of the negative P waves in Figure-3 is identical to P wave morphology in Figure-4. Therefore it is most likely that all negative P waves in lead II are retrograde! The Laddergram in Figure-5 illustrates the mechanism we propose. Just like forward-conducting reentry SVT (SupraVentricular Tachycardia) rhythms have option to conduct down either the "fast" or "slow" AV nodal pathway — ventricular beats that conduct retrograde have similar option to utilize either the "fast" or "slow" pathway when they conduct back to the atria. 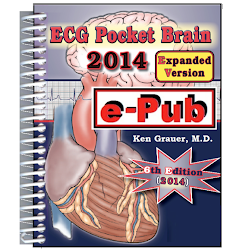 Most of the time such retrograde ventricular conduction utilizes the "fast" pathway. In this case — We suspect retrograde conduction from ventricular beats #3,6,9 and 12 in Figure-5 are conducted back to the atria using the slow pathway! (red dotted lines in the laddergram). This is the most logical reason to explain the dramatic increase in retrograde RP' conduction between beats #2,5,8,11 vs the much longer RP' interval for beats #3,6,9 and 12. Because of this slow retrograde conduction from beats #3,6,9 and 12 — there is time for the fast pathway to recover, which allows forward conduction of an "echo beat" to the ventricles (beats #4,7,10 and 13 in Figure-5). There remains the question of WHY retrograde conduction from ventricular beats #3,6,9 and 12 in Figure-5 utilized the slow pathway — but uniformly uses the fast pathway for retrograde conduction for all of the beats in Figure-3 (shown below in Figure-6). Note that the rate of AIVR in Figure-6 is slower (~85/minute) than it was for beats #3,6,9 and 12 in Figure-5 (where the shorter preceding R-R interval of ~600 msec corresponds to an AIVR rate of ~100/minute). Therefore — there is more time with this slower AIVR rate in Figure-6 for fast pathway recovery, allowing 1:1 V:A retrograde conduction in Figure-6 with a short RP' interval. You'll recall mention that the patient's BP decreased from 130/75 mmHg in Figure-5 — to 100 mmHg systolic in Figure-6. Perhaps this was because there is at least some "atrial kick" occurring in Figure-5 (albeit by non-sinus-initiated echo beats) — vs complete loss of the atrial kick in Figure-6, in which all beats originate from the ventricles. Figure-6: I have labeled Figure-3. RED arrows indicate retrograde atrial activity. At the slower AIVR rate seen here (~85/minute) — there is enough time for the fast pathway to recover and allow 1:1 retrograde conduction with a short RP' interval. FINALLY — There remains this patient's 12-lead ECG (reproduced below in Figure-7). Figure-7: I have labeled the 12-lead ECG that was shown in Figure-2. RED arrows indicate atrial activity in lead II. Note that the rhythm changes with beat #5 in lead aVF! (See text). The rhythm begins for beats #1-thru-4 as was illustrated on our laddergram in Figure-5. But then the rhythm changes with beat #5! Even though we do not have a simultaneously-recorded long lead II — We know the rhythm changes, because there is no negative P wave preceding beats #5 and 6 in lead aVF (green arrows). It is difficult to tell if there is any P wave at all preceding beats #5 and 6 — but we certainly do not see the negative P waves we saw earlier in lead aVF in Figure-4. There may be a sinus P wave preceding QRS complexes in lead V1 (blue arrow with question mark). Against this theory is the very short PR interval .... but there certainly does appear to be an upright deflection preceding both QRS complexes seen in lead V1. While not certain of the mechanism for narrow beats #5-thru-10 in Figure-7 — at least the rhythm is supraventricular and the runs of AIVR have at least temporarily stopped. P.S. Now return to Figure-6 and measure with calipers the R-R interval for each beat in this rhythm strip. Note that there is subtle-but-real variation in the R-R interval! Thus, this patient's underlying AIVR rhythm shows variation in rate — which sets up conditions for the alternating differing availability for retrograde conduction in fast and slow pathways that we saw in the laddergram in Figure-5.